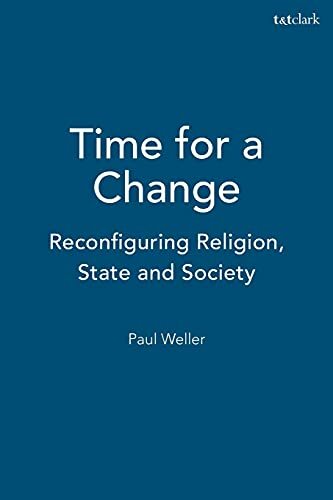 In Time For a Change, Paul Weller argues that continuation of the establishment of the Church of England is theologically and politically inadequate to the religious, social and political landscape of the twenty-first century. Theologically and ecclesiologically, he suggests that reluctance actively to consider alternatives is symptomatic of a lack of confidence that needs to be overcome. Socially and politically, for a society that aspires to be inclusive of people of many religions and none, the continuation of establishment is argued to be inequitable. Within an outline of the contemporary religious landscape and the empirical results of research into the nature and extent of religious discrimination, Time For a Change traces the historical and contemporary contours and implications of establishment. A range of alternative social, legal historical, theological and ecclesiological approaches and models are examined and aspects of 'negotiation theory' are used to explore the conditions and dynamics necessary for transition and change. Finally, Weller argues that often-neglected perspectives of Baptist Christian tradition - in particular its theologically founded commitment to religious freedom and voluntaryist ecclesiology - offer more adequate resources for shaping the Christian future in a religiously plural and secular society than perspectives historically associated with establishment. Time for Change shows that, through the conjunction of social, political, demographic, theological and ecclesiological developments, a 'kairos' or decision time has arrived for establishment. It aims to stimulate a social and religious dialogue leading to the evolution of a new 'socio-religious contract'. Paul Weller is Professor of Inter-Religious Relations at the University of Derby and Visiting Fellow in the Oxford Centre for Christianity and Culture at Regent's Park College, University of Oxford, UK.